This template of a burger menu is best presented on a digital menu board and placed at the entrance or indoors of the restaurant. 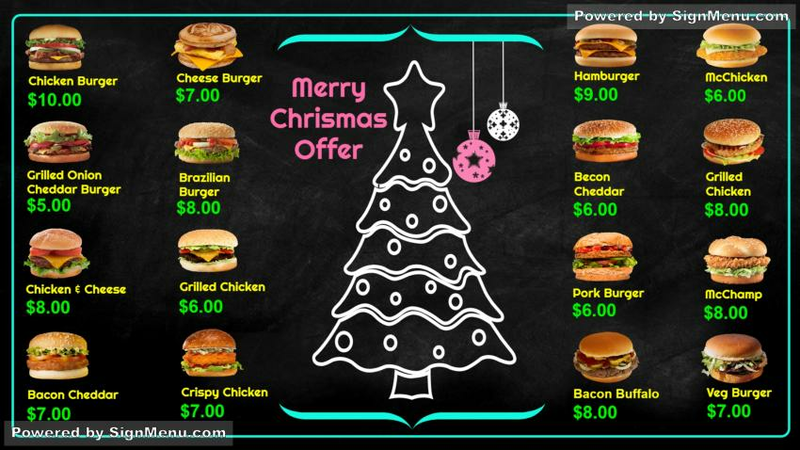 Quick service restaurants look forward to festive occasions like the Xmas / New year's as this gives them the opportunity to innovate on their menu and offer fresh items to eager customers. Recent advancement in digital signage technology has facilitated several rewards for you. They are by way of better customer engagement, enhanced inventory & logistics control, automated updating of menu content, remote control of operations and many more. All of which would either save costs or increase your sales significantly. This template is ready for download and use.